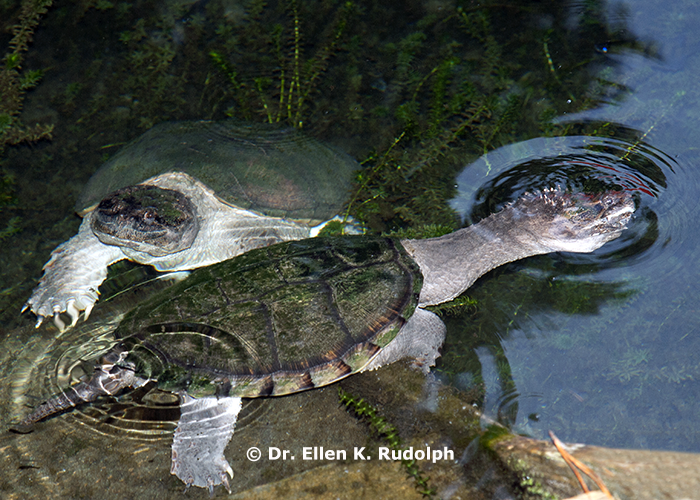 Living on a freshwater river in Central Florida offers many opportunities for observing wildlife. 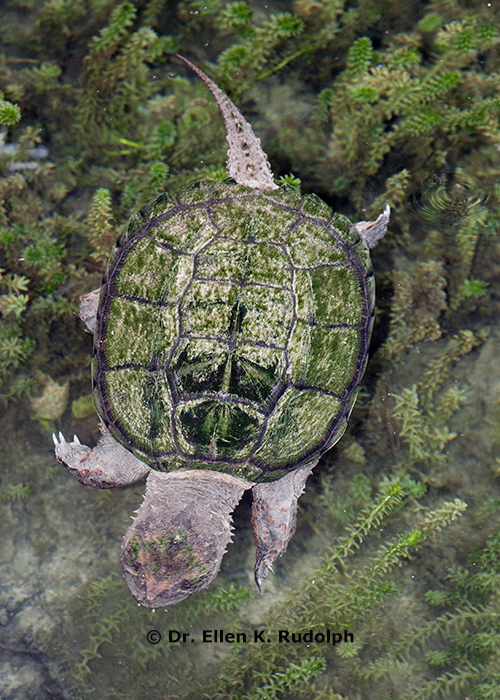 These photographs are of two freshwater Florida snapping turtles that, by their very nature, are seldom observed so close-up in the wild. 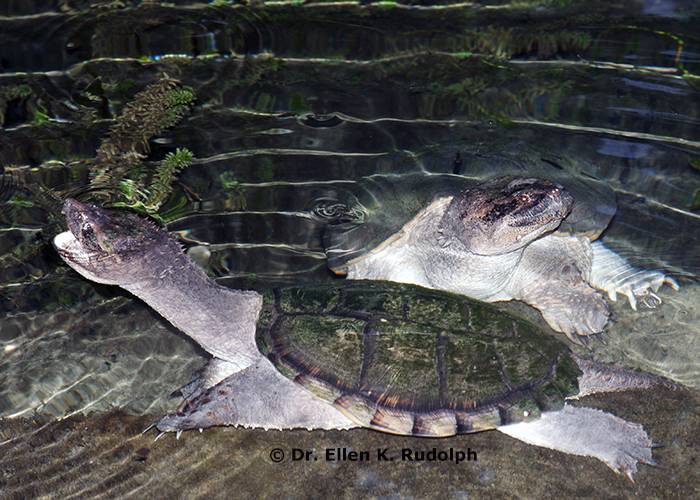 Chelydra serpentina osceola is an aquatic turtle that grows to be quite large in size. It reaches a maximum size of 18" and 35 pounds. They are primarily active at night. It has a large head with a pointed snout and a long neck that is covered with projections called tubercles. Its limbs are powerful and heavily clawed and its toes are webbed. The long tail has a row of dinosaur-like saw-toothed scales along the top. It swims well but typically is found walking along the bottom of the riverbed. 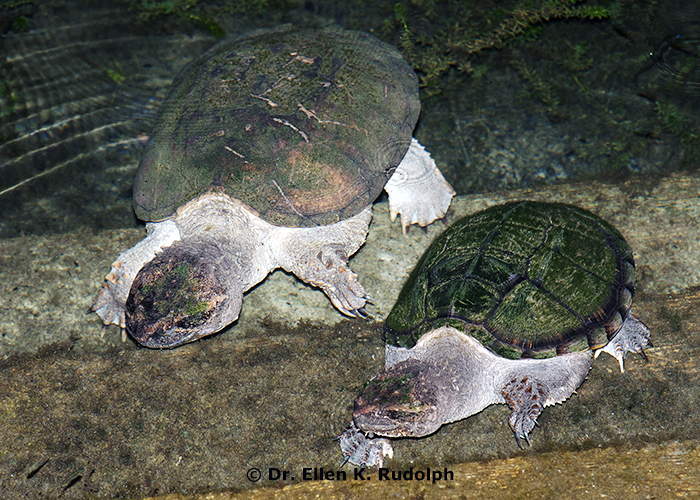 In fact, it spends most of its time lying on the bottom of the river or buried in mud in shallow water, and is seldom seen basking in the sunlight like other freshwater turtles. An omnivorous creature, it eats almost anything that it can grasp with its sharp jaws, including the wing of an unwitting Cormorant that gets too close. It is an aggressive predator that eats a wide variety of wildlife. 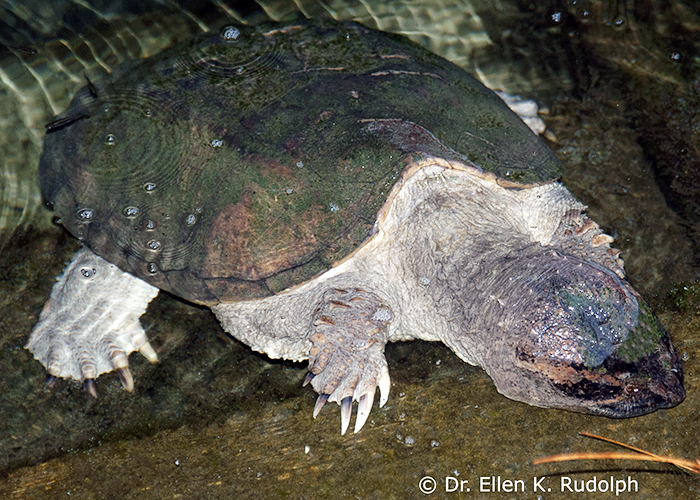 They enter hibernation by late October, buried under mud and debris, and they reappear usually around the end of April. 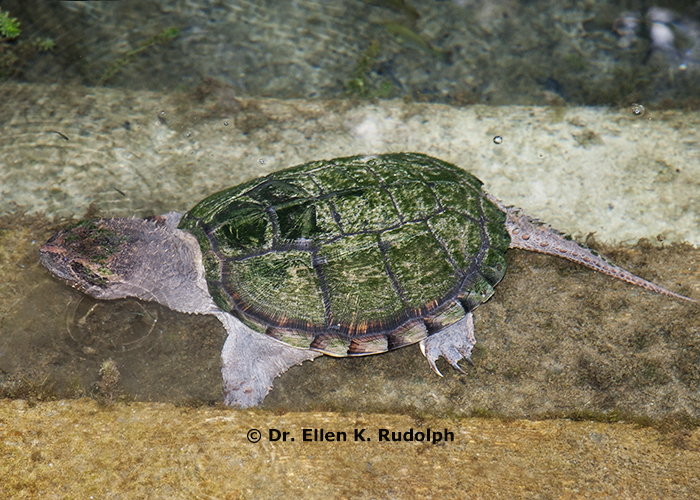 Snappers have a tendency to stay in one general area from year to year. 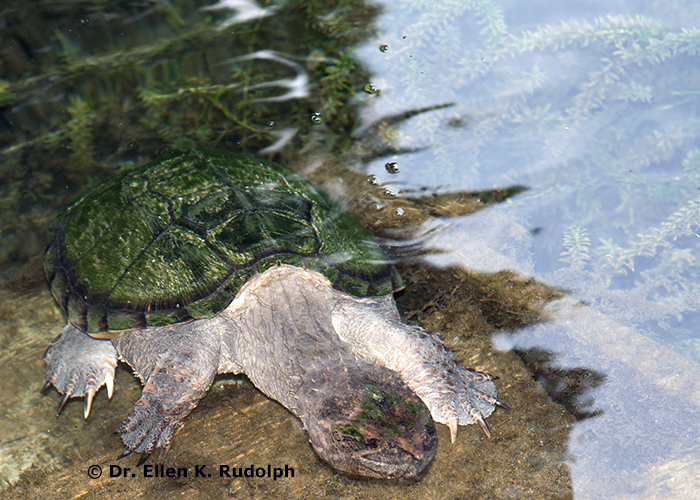 Unfortunately Florida Snapping Turtles suffer from poaching, habitat loss and degradation of their environment by pollution, pesticides and nitrate contaminants from agricultural and runoff from human and animal waste. Toxic contaminants are implicated in the reduction and viability of eggs and mortality of younger specimins. These images were taken at dusk as the snappers moved around the submerged steps of a dock. Only the very tops of their heads or snouts occasionally popped up above the surface of the water. 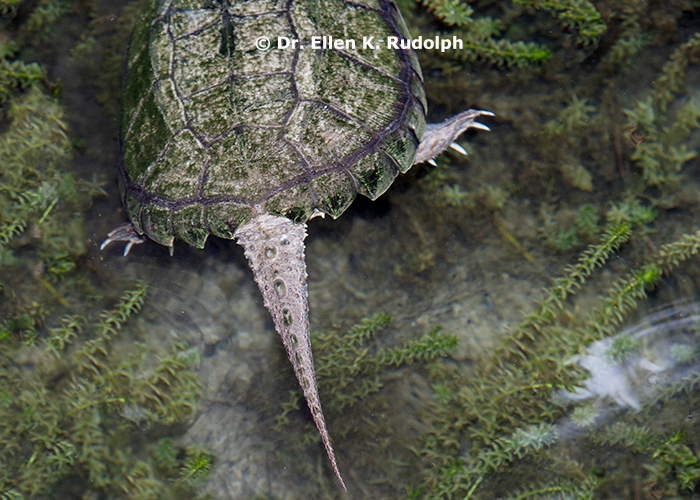 A red arrow (above) points to an infestation of leeches on the turtle's head. 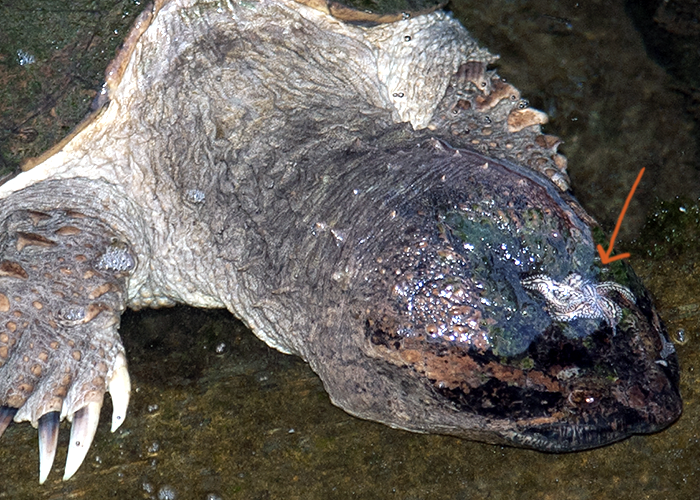 The freshwater leech is a parasitic worm that feeds on the blood of its favorite host, snapping turtles. It also commonly infests fish and frogs in the lakes, marshes and slow-moving streams that it inhabits. Find out more about how freshwater leeches HERE. 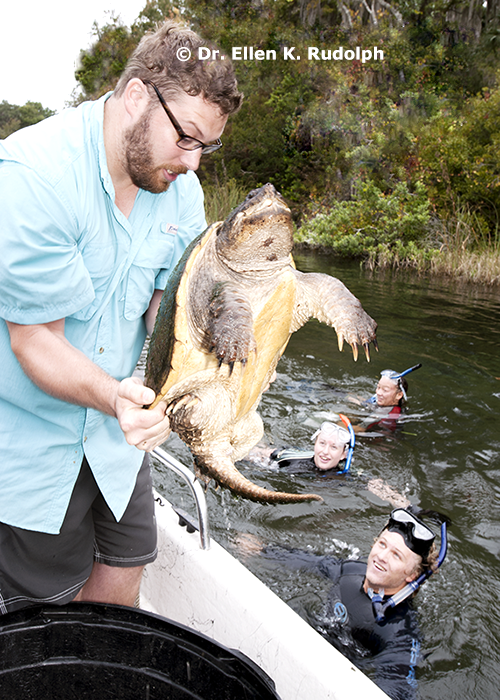 This is what an adult (35 lb) Florida Snapping turtle looks like out of the water: it was captured and measured, then returned to the river that same day by the Eckerd College Dept. 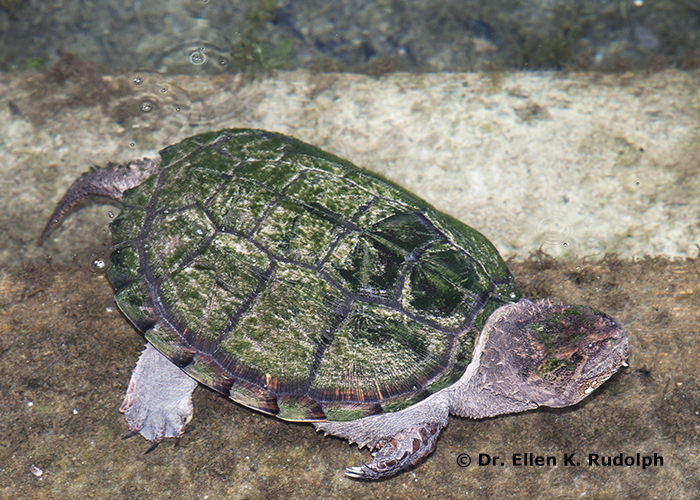 of Biology Turtle Sampling Project. 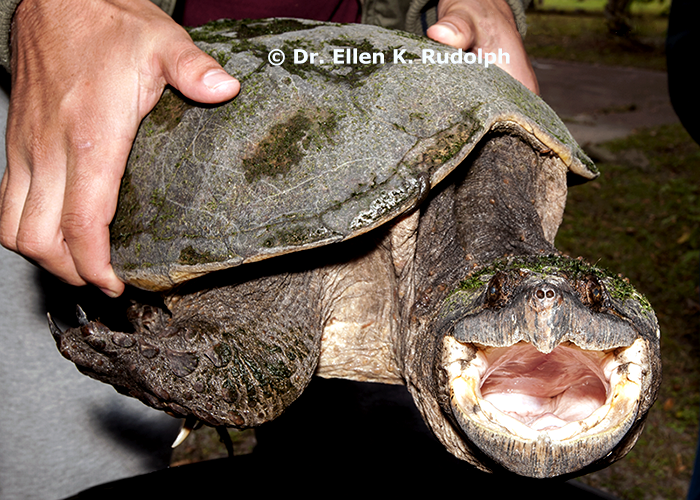 The Florida snapping turtle has powerful jaws and strong neck muscles, and it can extend its beak around to the side at least half the length of its shell (carapace). Its legs are large and powerful and webbed with sharp claws. 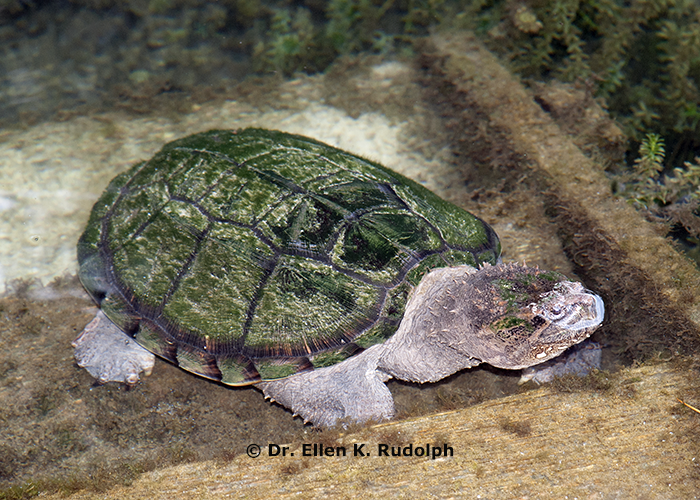 Its snout is more pointed than that of a common snapper. 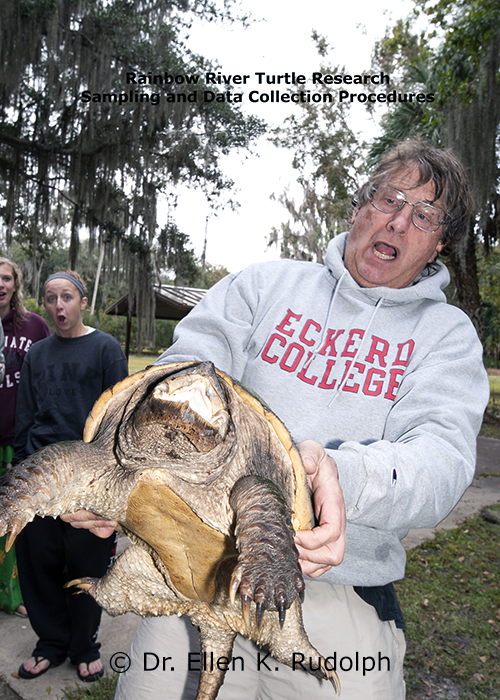 Professor Meylan with a giant Snapper! The images, text and style of this site are licensed for viewing on your computer through your Internet browser during your visit. No rights to down load, save, copy, print, redistribute or use in any other manner or method are allowed or implied without the prior written consent of the copyright owner. Any unauthorized use of the images or literary content herein is a violation of federal and international copyright laws.